Podthoughts by Ian Brill: "Battleship Pretension"
Are good podcasting skills contagious? Not that Battleship Pretension was a bad show before Never Not Funny’s Matt Belknap appeared on the twenty-third episode. It’s just that I have noticed since that appearance hosts Tyler Smith and David Bax have improved as podcasters and made Battleship Pretension a much better show. The earlier episodes had stimulating content but they started with awkward conversations between the hosts. These newer episodes get right into the movie talk. 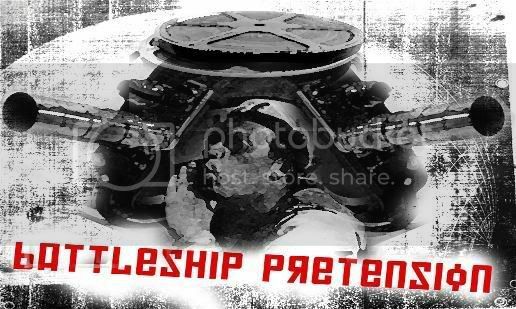 Now Battleship Pretension is the latest podcast I look forward to hearing every week. You’ve probably noticed that I’m especially interested in discovering podcasts about films. This reflects my own fandom. Film as a topic offers limitless discussions possibilities. What matters is the quality of discussion. I enjoy Filmspotting but I’ve felt lately that hosts Adam Kempenaar and new host Matty Robinson can be more than a little snobbish. I liked the format of Watching the Directors but Joe and Melissa Johnson’s commentary rarely goes beyond the superficial. Battleship Pretension’s name is actually a misnomer. Listening to Tyler and David I don’t hear much pretensions. Rather, I hear two guys who are extremely knowledgeable of films but never turn that knowledge into haughtiness. They’re style lands right where I want movie discussions to be. Tyler and David open episode twenty-five by creating some talking points designed to be controversial to combat the idea that they’re far too positive on the show. I’ve got nothing against the positive nature of the show as it’s clear coming from these guys’ deep understanding of the medium. How much do these guys know movies? Episode twenty-five is devoted to the work of cinematographer John A. Alonzo, who worked on Harold and Maude and Scarface. It is one thing to talk an hour about a director but to talk about a cinematographer is really impressive. Tyler and David pay close attention to how Alonzo changed his approach from film, sometimes being an acolyte of the French New Wave with its shaky camera work to going in the total opposite direction and having very centered shots in his later work. The best compliment I can lend to Battleship Pretension is, with just the previous example alone, it changes the way I look at films I already love.